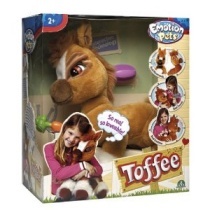 Friday 26 Apr - Amazon currently have stock of Toffee the Pony for £26.53. At Stock Informer we provide up to the minute alerts for Toffee the Pony stock. 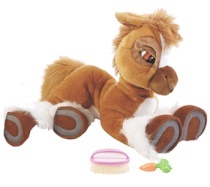 Our servers track both online stock and High Street Shops and provide a free email when we find Toffee the Pony in stock. At StockInformer.co.uk we take your privacy very seriously. We hate spam just like everyone else. We guarantee that we will keep your email address and personal data strictly private and NOT pass to any third party. You can stop email alerts at any time by going to the 'My Profile' section on the website and deseleting the email options. You can also deactivate your account at any time, which will completely wipe all personal data relating to you from our systems. Use this web application to automatically alert you with either a popup or audio alert when new stock is found. Just leave the page open on your desktop and it will refresh itself every 60 seconds. Found High Street Stock? Please Report it! The delightful Toffee the Pony is just waiting to be hugged, cuddled and looked after with love and care. He shows emotions and realistic movements like no other electronic pony tony on the market. When he awakes, Toffee opens his eyes and greets you. When Toffee feels hungry, he will call you for food. Feed him his carrot and he will happily chew away! Toffee the Pony loves to play and will sway his head and neigh at the prospect. He will get scared if he hears a loud noise, he will close his eyes and tremble. Just brush his back or feed him and he will calm down. When Toffee is tired he will close his eyes and fall asleep. Much of the allure with Toffee the Pony is that every day is different. 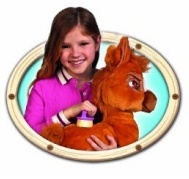 Toffee the Pony is totally unique and is the first branded 'Emotion Pet' having no restricted movement whilst also staying luxuriously plush. For ages 3 years plus. Requires 4 x AA batteries (not supplied). Size (H)50cm x (W)42cm x (D)17cm. Unlike other stock checkers we check online stock every minute. We also track high street shops for Toffee the Pony stock, ensuring you are the first to know when stock is found. On Stock Informer, registration is free and enables you receive emails and text messages immediately when stock is found, giving you the competitive advantage in securing Toffee the Pony before stock runs out again. is the first branded 'Emotion Pet' having no restricted movement whilst also staying luxuriously plush. For ages 3 years plus. Requires 4 x AA batteries (not supplied). Size (H)50cm x (W)42cm x (D)17cm. Unlike other stock checkers we check online stock every minute. We also track high street shops for Toffee the Pony stock, ensuring you are the first to know when stock is found. On Stock Informer, registration is free and enables you receive emails and text messages immediately when stock is found, giving you the competitive advantage in securing Toffee the Pony before stock runs out again.